Our optical shop is located adjacent from our waiting room within the same building. We carry a large selection of designer frames for adults and children. 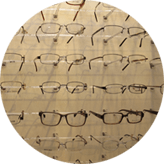 When you visit our optical shop, our highly trained staff will provide you with a personalized consultation while choosing your eyeglass frames and prescription lenses. Bone structure, undertone, eye shape, face shape and brow line… during your consultation with our optician, expect to be introduced to all of these terms. These details are unique to everyone and they all come into play when choosing the best frames to fit your face. Optician is just the optician to educate you on all of your best features and what will enhance them! Come to our Optical Shop to get one-on-one detailed attention and locate which frames will highlight the unique structure and color of your face, leaving you with a long-lasting smile! Your face is 60% longer than it is wide. Your face has rounded, soft edges. Your face is 60% longer than it is wide. Your face has sharp, distinct edges. The width of your forehead, cheekbones and jaw line are all equal. Your jaw is slightly rounded, as opposed to angular. The proportions of the height and the width of your face are close to ideal. Your jaw and forehead possess strong angles. Your forehead is the widest part of your face. There is a gentle narrowing of your bone structure traveling down to your jawline. Your face is widest is widest at the forehead and narrows towards your jawline. Your hairline comes to a central point on your forehead. Your cheek bones are the widest part of your face. Your jaw and forehead are equal in width while remaining narrower than the cheekbones. The length of your face will equal 1.5 times that of the width. This is the most versatile face shape.